In 2011, I paid $9.99 for a Thru the Bible study guide, which I thoroughly enjoy(ed). In 2015, because of an "upgrade," I had to pay $4.99 to be able to continue to access the Bible when I didn't have an internet connection. Later, in 2017, I purchased an add-on Bible version for $2.99. Now, with this latest upgrade / app change, you are FORBIDDEN from signing out of the app. You MUST allow Tecarta to track your activity. If you attempt to sign out, they will punish you by deleting all your PURCHASED content. This is just plain wrong. BE FOREWARNED! Best bible app on the App Store! I absolutely love the TecartaBible app. I look forward to starting my day by reading the scripture of the day! GOD bless you! I love sitting every morning outdoors while the sun rises and enjoy the quietness of a new day as I read the scriptures on my phone. It is so easy to read, search and go back to messages that I enjoy. It’s a blessing to have my Bible daily reading no matter where I go. Love it! On a scale of 1 to 10, I would rate the Tecarta Bible app a 10+++. I have purchased several translations, study bibles and commentaries through in-app purchases. The excellent functionality of the app allows me to make the most of all these resources. It has reinvigorated my scripture study in a very positive way. Thank you Tecarta! I love the ability to download all sorts of translations. The graphic interface is amazing. I got the Tyndale New Life App about six years ago. I was very happy with it at first. Then they started updating it. Each update was a radical change that became more difficult to use, and removed features—most recently, the ability to highlight words or phrases, which was just idiotic. Navigation was ever more difficult and the overall experience ended up being an ordeal. Then I suddenly got a message that the New Life App has been retired and that I could transfer my purchases here. Wonderful. I’m liking this Tecarta App much better! Good riddance, New Life App! This Bible app is so helpful. Thank you and God bless. Everything I need in a phoneBible! This app is great. Love the ability to cross reference and the footnotes. Also, being able to go back to previous scriptures. It works smoothly too. There is more good features too. Totally recommend. I just love this Bible! It wakes me up and starts my day with a scripture of love and knowledge that makes me feel absolutely refreshing. It’s a great way to start my day! The app is very easy to use. You really don’t have to figure anything out which is a plus. Self explanatory and ease of use is very important to me for any app! God bless tecarta! The Telstra KJVS app is easy to use, yet very thorough in duplicating the content of the hard copy version of the Bible. Worth the price. And perfect if you use a pad for Bible study. This app works online and offline. Great customer support from going device to device. May versions and translation available. Bible study or a daily devotion on-the-go or for stationary study!!! I have used this App nearly every week over the past few years as part of my sermon preparation. Yes, you need to purchase the various translations, commentaries and study bibles but the prices are fair and to have them all in one place, is a huge blessing for me and I can work on my teachings at anytime or anywhere. Keep up the great work! My only recommendation would be to add more translations in foreign languages (ie German). I don’t want to ever see home view. Of course I have it turnt off. It’s been off and I hadn’t seen it unless I choose to. There was an update and now I’m being spammed with the home view. I hate the home view. I never want to see the home view. You set the algorithm to intentionally spam user with the home view. Do right and fix that. I love spent hundreds of dollars on books. I don’t ever want to see the home view. Still waiting to be able to Highlight and underline same passages of scripture. Thank you. I am enjoying this app!!! It defines words with a tap on the word! It also cross reference with other scriptures! You can highlight and underline the scriptures and it places them in notes to refer to later! Love it!!!! Very user-friendly. What a blessing! I love this app. I keep all my messages stored on notes. It’s easy to navigate and it’s nice to be able to work on messages on both by iPad and I phone. This is the best bible app I have bought and used. User friendly, access from multi devices, tons of resources, affordable prices!!! These are some of the best study Bibles you could use. One has the opportunity to compare, make notes and study. Just simply awesome.... The written word study to show thy self approved. Best bible I ever had! This bible is the best and really easy to use I also love the devotional! I like having the Bible with me wherever I take my phone. A bit easier that taking my book version. Very easy to look at any verse you want. I love the entire setup, library and all of the options available. I also like that being legally blind, the font enlargement is perfect for me. I love that I can parallel different Bible versions side by side. I’m old school and love my KJV but as my pastor uses all different versions, I can read along with his and mine. This little bible is such a blessing! I use it every day to start my day off right! The new "verse of the day" is a great added feature to bring an extra little sunshine to my day! This app beats all the apps I have used. Make highlighting colors more personalized by allowing more choices not just 4 colors just like you version. Still waiting on Dake Bible becoming available Keep up the good work! I’m PROUD of the DUST on MY Bible...because I’m using my DIGITAL (Tecarta) BIBLE ! I think this is a great tool. The resources are great,but, I can only use the trial times of the resources. They can be so high in price. Hey guys. This just started happening. I'm freezing up. Uninstalled and reinstalled. Didn't fix it. Wish I could have sent from inside the app as your app is amazing and I'm sure this is a temporary glitch. Promise to update review when resolved. Could be on my end?? IPhone 6s plus. Thanks much! There is nothing more important and fulfilling then reading the Bible. This app has many translations, study and devotional tools in an app that is easy to navigate and use in many ways. I love having multiple translations, study bibles and sectionals. They cost a fraction of the price of bound books and are always with you (they offer specials quite often) so you can enjoy anytime. This is the only study app I use and I can use it on both my apple and Samsung products. I can take notes on tablet then open them up on phone later in the day. Plus all the additional purchases are worth it to study out God’s Word both for personal study and for the writing of the lessons I do each week. I get so much out of this bible it has commentaries and cross references and so many resources. This app is versatile and beautiful. God has used this app to speak to me and draw me nearer to Him within the weeks that I have been introduced to it. I praise God for the excellence that was poured into creating this app so that hearts everywhere may know and receive and draw near to the Heart of God! I have used this app for several years. It works well on both my android and iPhone. I like the search feature and a really like the bookmark feature. The ability to look at/compare different translations is handy though I don’t use it as much as I probably should. Overall I have been very pleased with my Tecarta Bible. I have had this Bible app for the past few years. I love being able to put two versions side to side, especially the KJV with Strong’s Concordance matched with the NKJV. It helps with understanding the meaning of words. While certain versions do cost, I believe it is worth it. Amazing! Best bible app available. Please make in-app books. I’ve spent $100s of dollars on content. Problem is I’ve used over gig and a half just on additional material. Please condense the size of the content. It’s ridiculous how large these files sizes are. Great. Keep up the “good work”. My favorite Bible app — now even better!!! I know this is the Apple App Store and my review should be for the iOS app. It is and has been my goto Bible for many years. To me, the updated companion site is the “killer feature” that puts Tecarta over the top. Developers — I love, love, LOVE the new tecartabible.com website. Having years of my notes available on my PC is so helpful. I also love that the search box can return book/chapter/verse or text results from multiple translations. The functionality is well thought out and the interface is clean and intuitive. And, everything syncs seamlessly between my iPhones, iPads, and PC. Thank you for always producing excellent study tools, for listening to your customers, and for keeping it simple. My favorite AND only Bible app! I have been using Tecarta as long as I have had a Smartphone. I even purchased other texts, I currently use KJV and CSB with this app. As an phone sales manager I even download this app for clients when they ask for a great Bible application that won’t bog down their phone with ads or take up too much storage. I seriously love this app. I love the daily scriptures and notifications. I love the free daily devotional from various devotionals for private study time. It’s easy to highlight and recall highlighted verses. You will even have a place to make notes on where you are currently studying in scripture. This app has everything you need to further develop your relationship with Christ in today’s ‘on-demand’ culture. I’m sure there are other great features I have yet to discover. I’m not a huge fan of digital reading (my Kindle hasn’t been charged in months), but this really comes in handy when getting into a discussion on scripture with a friend or colleague or who ever you may encounter. Thank you Tecarta for creating such a beautifully simple and easy to use Bible. Blessed be those who believe in Christ., through Christ., for Christ., because of Christ., always in Christ., forever in Christ., and believe in Christ... Read His Gospel, God " Our Father." In Christ " Our Our Lord." In spirit, and in truth., Amen. I enjoy this translation and use it as a comparison when reading other translations or using scripture confessions as added explanations when confessing the Word. I haven’t had the opportunity to use all of the different icons yet. I am very grateful to be able to access different Bibles at the touch of a gear. It has made the study of God's Word more inductive. Thank you! I gave it 4 stars as I wish there was an option to save favorites verses & chapters. gives you multiple ways of understanding as to help you be more confident and faithful. Knowledge is Power, Intelligence is Action, Strength comes from growing both. I was on a mission to find a great Bible app, and after downloading and trying four other apps I tried this one. I am totally blown away! I am reading God's word regularly now, something I've struggled in the past to make a regular habit. I would like if there was an icon or indicator next to the verse for my notes, but that's a minor gripe. I'm just thrilled with this on so many levels! Great job! This is by far the best app. I get a biblical passage everyday that I love. Everyone should have this app. I have it on every phone I own! I use this as my daily driver. I’ve found Tecarta to be a clear, simple way to interact with the Scriptures at a reasonable price. Really enjoying my app. I was in a rush on Bible study Wednesday, forgot my Bible. Thank God I had my phone. I was able to keep up with class. I give it five stars. Easy navigation. Good selection of translations. Pricing is economical to be able to have a Bible at your fingertips. I've had it for a couple of years. Really like that I can save verses or devotional of the day. Very easy to navigate. I will say that this Bible is very good. Notice all the different translations and features that are stated in the description - other than the KJV, the rest cost $. Also notice the app says it supports “family sharing”. Well sharing only works for the default KJV bundled in the downloaded app. If you pay “in app” for any add-on translation (NIV, ESV, NKJV, etc), study bible, etc it costs $. Furthermore, you cannot share those purchases with family. So while it is a decent bible with very good features, the shady nature of this app presentation is not representative of good sales practice. The app is not as feature rich without a good deal of $ as the description leads one to believe. So easy to use and understand! Very readable. Cross referencing. Quite helpful in study.. great 👍 for anyone just to read or advance in learning what God has sent to us to learn and obey. HALLELUJAH. God bless u all. Mrs Fadayomi The best all round. Very explanatory, makes me to love to read the Bible always. No word is removed. Easy to use! it let you do margins notes, highlight verses, copy verses into notes. It let you read and use the bible in any way you want and customize in any way you like! And it can be bilingual too! I think this is the best Bible App ever! This Is The Bible App You Want! I've tried every bible app out there and for lay out and ease of use, this is the one you want. Everything can be done from inside the bible reading mode such as note taking. 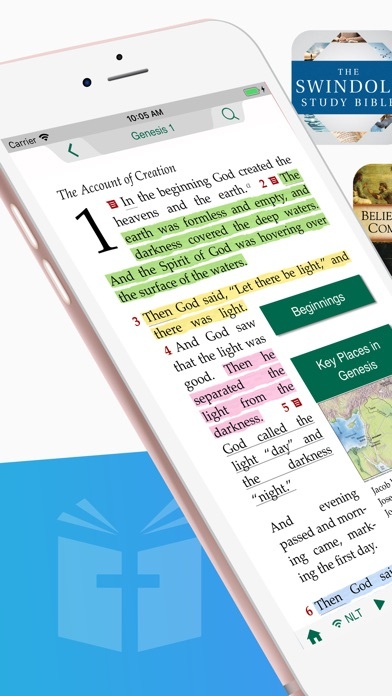 You can use a bible version along side a study bible with a different version and have the advantage of all the study notes while reading in a different version. It's great! Update 3/24/2018: More hyperlinks please and thanks! Hoping that someday anywhere a cross reference to another verse is mentioned, you can simply click on it to go to that verse instead of having to navigate to it...or, better yet, have the verse as a pop up with the ability to navigate to it from within the pop up. Forgot to say thanks so much for adding the Passion Translation! I have been studying the Bible for almost 50 years and this app has proven to be one of the best tools I have ever had. It gives me access to all the resources that fill a bookshelf and it is in the palm of my hand, literally. Whether you are a new Bible Student or a seasoned Bible researcher you can’t go wrong using Encarta Bible App. I really enjoy the built in note feature; it has come in so handy. The thing I wish is the highlighting would let you do a whole section at once instead of just one verse at a time! This One of the Best Bible Apps I have ever used! I simply Love this Bible App! Lots of excellent features to fine-tune readability and note taking. This app just keeps getting better and better. Here are some of my favorite features: 1. I can add my own notes in any verses I read. A little icon appear so I can read that note next time I read that passage. It also keeps track of all those notes in one place so no need to search for notes in the Bible. 2. I can copy and paste any verse or note I have written and place them in any document on my iPad. I suffer from arthritis so am now doing my Journal in a word document app. I copy and paste my notes and verses that speak to me right into my Journal. 3. The search function offers a complete concordance. Type in a word and see every verse that uses that word. You are given the choice of the exact word or all tenses of it. Tap on the verse and it takes you right to the chapter where you can copy and paste the verse into another document. 4. There is a function that brings up the last 50 verses you entered to read. A great way to see patterns in the verses God has been using to speak to you, or just to find that verse you were reading last week. 5. Verse of the Day, Tip of the Day and a Devotion appear the first time you open the app each day. I learned about the 2 of the above helps in Tip of the Day. 6. It has an audio component so you can listen to the Bible. I recommend purchasing a study Bible and translations of your choice through the app. It will give you all the notes and helps associated with that Bible. Great app one of the Best! Great app just missing Tree of life Bible other than that definitely one of the Best! Never had such diversity in one tablet! I really enjoy having two Bibles open at the same time and read the translations. And I really enjoy the opportunity of purchasing multiple translations and carrying them in my purse on a tablet. I have tried them all...the only one comparing is Bible.is and that’s because it’s audible but this app is my go to and my family’s go to! Thank you tecarta for a wonderful app! God bless you!! One of the Best Bible Apps!! I’ve used the Tecarta Bible app for well over a year now. It is one of the best Bible apps I have tried! I have 9 Bible translations, 5 Commentaries and 2 Study Bibles. Everything just works!! Verse highlighting with 4 colors, social sharing, bookmarks and personal notes all help in studying and memorizing Scripture! I highly recommend this Bible app!! You have hit a homerun with this app! Wow! A very intuitive Bible app interface. I use it numerous times daily. Powerful. Easy to use. It makes reading the Bible an adventure every time you open the app. Immersive. It makes putting the Bible down very hard. A complete Bible resource including Bible versions, study Bibles, commentaries, and devotions..........I would like to see in the future more Bible resources such as Bible dictionaries, and more commentaries etc. Just can’t say enough about this product, as I’m thoroughly pleased with this product. ...in church and at home! I love being able to search & find in both the KJV and NIV. I love the notes as well... just let the Spirit show me which scriptures to put in my heart daily. I also purchased the men's daily devotional. I'm about to drink a cup of coffee and read it right now to start my Saturday morning. 🕺🏽 I would and do recommend this app toeveryone. I have used this app daily for years. I have several versions of the Bible in it that I keep open side by side. I have several commentaries I reference within this app. I have a concordance and a really good devotion that quotes some of the best Christian forerunners and examples we look back to. It makes reading, learning, and studying the Bible a wonderful experience. And the help desk support system (if needed is good). Highly recommended! So blessed to have this with me every where I go!! I have been working on my life for two years now and this app has made it very easy! I love that I can mark off what I have completed. I read the devotions daily but I’ve completed that a while ago so now I just scroll it and what ever it lands on is what I read that morning. I let God choose it for me lol. I guess when I complete the last one (which I am close) I will undo them all and start over! It has given me something everyday for two years! I love it and highly recommend it! The Tecarta team did an excellent job with this app. It has an array of translations, study bibles, commentaries, devotionals, and more. HOWEVER, they need to add MORE SPANISH translations, study bibles and commentaries. They have literally no spanish study bibles nor commentaries. Please Tecarta add the following translations in spanish: TLA (Traduccion en Lenguaje Actual), DHH (Dios Habla Hoy), and the PDT (Palabra de Dios para Todos). Please also consider adding the Strong Concordance in spanish as well as the Matthew Henry’s Concise Commantary. I know a lot of spanish readers would really appreciate all these requests. I know I’m asking a lot, but the bible says ask and it will be given to you. Thank you very much and my our Lord and Saviour Jesus Christ richly bless you. I really love this bible app. I’ve have learn so much using it. I love that I can take notes within my app do that I can refer back to them if need be. You can also purchase other bibles and bible versions for really reasonable prices which has also helped me with studying! I can’t say enough good things about this bible app! Awesome Bible App. God bless the entire team. More grace. It was a little difficult at first to figure out how to make full use of the study Bible I purchased but the staff was very helpful and responded promptly to my questions. Good support and a an excellent study source. I’ve had this app for years and it’s very good. I have several bibles in it, I love the highlighting feature. I love the fact that you can take notes on it and you can see the word at on the same page if you use a tablet. This an easy to use full featured app. An excellent Bible tool and the in-app purchases are wonderfully reasonable. I would highly and honorably recommend this Bible Tool. Love this App!! Can read, highlight, and notes and more!! Been using this app for a long time! This app is user friendly and the in app purchases are reasonable. Downloaded just yesterday. It is perfect for my bible journaling. This allows me to get to the meat of God’s word. Thanks for making this app available. I love the fact that I have all my versions in one place. Versions are available you can compare both and make your notes highlight with different colors etc! Easily the BEST Bible app on the market! This Bible app goes way beyond the call of duty. Everything from the smooth experience and intuitive controls to the variety of study tools and ability to choose almost any version of the Bible. I have had numerous other Bible apps in the past and not one of them comes close to the Tecarta Bible app. Innovative features like having different search functions such as using a scroll wheel (that uses the iPhone's Haptic Engine as you scroll) to search through the Bible feels organic and satisfying. There are also a really healthy amount of ways you can bookmark, highlight, and save your notes within your Bible that I find very useful. Having the ability to make an account and save your Bibles and notes everywhere you go is a very convenient feature that wraps the entire package up nicely. I also love the fact that the app can notify you every morning of the verse of the day, while the devotional of the day nests right below it. It's a beautiful, intuitive, and useful app that I consider to be the best among Bible apps. 5/5 - Excellent work. I really have been in joying this app and the pricing is very reasonable. This is my favorite Bible app. They offer so much. Thank you for having this Bible online for us users. It is an amazing help when searching for critical information. This bible app is awesome. For me, the possession of multiple Bible translations on my tablet is awesome. It is easy to switch Bible translations and to utilize study Bibles. The daily verses are a great feature as well. Of course there is always something that can be better or improved. That is because whatever it is, it’s not God and only God is perfect. However, I give this Bible app 5 stars because it is one great tool for assisting you to get closer to God through the words written by the scribes. Peace & Blessings. Don't trust the publisher of this app. This app does have lots of fancy features. And I think they did a good job building it. The publisher is apart of a Cult in the Bay Area. The Cult claims to be Christians, but they are a nut job. The CO of Tecarta is a knucklehead. Love the user friendliness and overall look on the app. Thank you for this! I use quite a few different versions, so I was wondering is there a way when you highlight a verse in one version it will highlight in all the versions that were purchase and of utilized? The spoken Word is great! Like that I have so many different Bible versions and study Bibles, once a day devotional and Bible translations to choose from to grow in my knowledge and understanding of Gods Word. I use this app every morning for my quiet time. I love this app! I use NKJV, KJV. I downloaded the KJV life applications study bible and love how I can highlight a verse and simply click the life tab to have a full commentary and strongs concordance! This is the only bible app I ever want to use! I love my Tecarta Bible. Taking notes, searching verses by reference and word, downloading Bible translations and commentaries as well as links in the Bible to additional details. It is a great user friendly Bible app. I’ve been using the Tecarta Bible app for years, it’s easy to use. Some of the things I love about the app is the split screen that allows you to view 2 Bible translations @ a time; the devotional, commentaries etc for purchase, & that you can try them for 3 days before purchasing; I love that you can take notes & save scripture verses. I start my day with Tecarta. It was hard to find online program that was easy to read and navigate through. This one meets all my expectations. I've been using this app for a few years & love all the Bible's the come out with. And everything is in one place! Which I love!! I study a lot so it’s Kershaw I have a best tools at hand. I love that I have pretty much everything I need in one place to study the Bible. I just wish there were more tools in Spanish. Thank you so much! This app is a huge blessing!! Seems they thought of everything. Love it! Hate the new app. Doesn’t transfer purchases of which I have several in the old app. Guess I’ll be leaving and looking for a new Bible app. The verse of the day and daily devotion are a good way to start my day! I bought and paid for the life application study Bible. Now it’s gone and the content study notes and all are gone. Now I find that I can’t even copy any verses into my personal journal. I already paid for the NIV and had the Living Bible translations included, now they want me to pay again. What’s this? I don’t understand what’s going on. I really enjoy this app and how simple it is to use. So intuitive when looking at study bible notes with the Bible text. Thanks for the app. I run a Wordpress website on Christian theology and often make comments on YouTube regarding theology. I have frequently copied and pasted not only Bible verses out of several Bible versions I have purchased, but also Strong’s Concordance definitions as well. Not only in the writing of my website but in day to day comments I make on YouTube. I would be lost without this application. I love this devotional. I was sampling it for my daughter who has 2 children. I wish I had had this when we were young parents. It speaks God’s word into you and gives you insight and ends with questions to ask yourself, to think about. You don’t just read God’s word and then walk away. It challenges you to ponder God’s word in your heart and think and apply it. Such a blessing. Love the daily verse option & especially the ability to compare translations immediately. I think I’ve used this app for 5 years or more. Also love the NASB with Strong’s references. Very helpful Bible study tool. I really like this App. The amount of resources that I have right at my fingertips any time of day is amazing. I love to read the Bible and this app gives you the ability to have study bibles, commentaries, Strong’s concordance searches and more. The price of the resources are reasonable especially if you shop the sales. I highly recommend this app to all. It’s the best Bible study phone app that I have found. You can also use your resources on a computer now and I really love having that ability as well. Love this. I’ve been using it for years. It keeps getting better. The ability to create a folder within a folder is extremely useful. I ha a folder for the year and sub-folders for each month. Each day as I study, I create a note and the system dates them for me and keeps them in chronological order for me. A superb system that allows me to synchronize with my laptop, phone and ipad. .
5 star offline bible app !! This is an absolutely amazing bible app !! It’s offline !! It’s beautiful !! And so easy to use !! It’s a fantastic way to read God’s word from your device !! I HIGHLY RECOMMEND THIS APP !!!! This is the simplest, fastest and extremely useful app for Bible study and preparing teaching for service, noonday teaching and Sunday School. Very glad to have found this app, I use it daily and find that it is very useful. App works great! I can read anytime. An amazing voice even reads to me when I enter book, chapter, verses, tap the start arrow, & let it download. I tap the pause lines to stop the voice from reading. It’s available in a variety of languages. I use this on iOS AND Android with seamless transfer of purchased translations and notes. I’ve used it for 10 years on almost a dozen different devices. Make sure your on WIFI when backing up!!! I initially thought I lost my history... Thanking God I have my Word!! Currently my go to app for Bible reading. I almost always choose this over my printed Bible, due to the side by side reading of two different versions! I use this app daily with my walk with God. It has almost every translation that you could think of. And the navigation through the various books is very user friendly. Taking notes is a breeze and very convenient. Love this app. Highly recommend. I love this app! 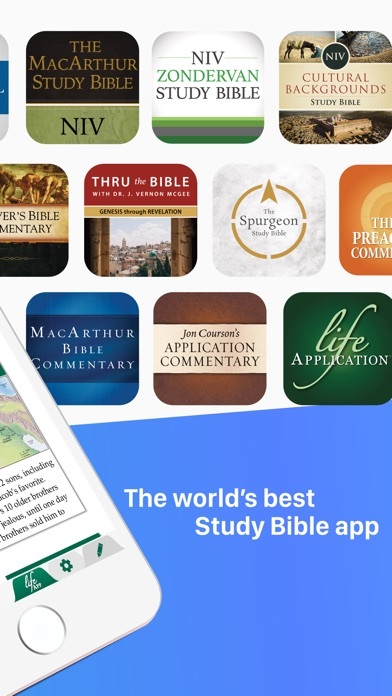 Within the app you can purchase all the major study bibles in complete form at a fraction of the cost in stores. It’s a wonderful tool for anyone studying the Bible and looking for an extensive library of resources at your fingertips. I currently have the NIV study Bible, ESV study Bible, and Strong’s Concordance and several other regular bibles. It comes with the King James Bible. The abilities of this app are just about limitless. I’ve only had it now for about 3 weeks, but look forward to a lifetime of study. There are so many to choose from and some are overwhelming with so many options to choose from, I think Tecarta has the right balance of what you need. I've probably used every bible app there is and no other offers so much content for free, such a variety for notes and sharing, and other methods of studying the Bible even more. Works very well for me, just about tried them all and this is my favorite! I guess “user-friendly” doesn’t mean the same to all people. I had the Life Study App and was forced to change to Tecarta. It’s been a nightmare from the beginning with long, multi-step instructions to make the switch and load all of my purchases. I couldn’t navigate the app. Contact support and get multiple long lists of instructions with pictures and I still can’t get my Bible and study material side-by-side. I use this app every day. When I study the Bible, the app should be invisible. I shouldn’t have to wrestle with the app. Once I briefly had it the way I wanted it, and then it changed. Now I have to access a drawer for study content and I have two copies of the same Bible passage side-by-side. I want my old app back. Awesome app by a great company! When I first heard of this developer, the NLT Study Bible was an app, I grabbed it and used for a personal study. I then hear that that app was being retired and got this one as a replacement, I have not been disappointed, I was able to transfer my notes and history to the new app and continue right where I left off. Nice job Tecarta!!! Perfect for general study or in-depth research. I find it very useful that I can insert my own notes and questions in an icon into the text for later reference. The app is very easy to navigate and the ability to tap on an underlined word for cross references and dictionary definitions is very helpful! It would be even more helpful if the dictionary reference was not a standard English dictionary but led to a Biblical Greek- English or Biblical- Hebrews- English definition. But over all I use this app instead of my old paper bibles in church and Bible studies. Supposed to be able to sync. When I sync it shows highlights and that a note was made, but I cannot read the note. Also even with notification settings all turned off it still shows the home page pop up with ads(I have a paid version) and verses. I am sad. I was hoping this could be my primary note taking bible, but I will have to go back to paper as the app is untrustworthy. So disappointed. Thank you for taking the time to make this possible. The ease of use and pricing for the add on applications is nothing short of a blessing. For anyone who is truly interested in learning, growing and hiding God’s WORD in their hearts needs not look any further. The ease of use and ability to perform in-depth studies on a specific verse, chapter or books is astounding. I love the convenience of having different translations and commentaries at my fingertips! The ease of comparing scripture with scripture and having Strong’s dictionary to research the original word meanings, is another plus in my devotions and study. So convenient when you're on the go and I use it as well when I'm home! I am loving the new audio bible. It is a small investment that is bring a great return on my daily devotion/bible reading time. Tecarta bible study is easy to navigate and a pleasure to use. 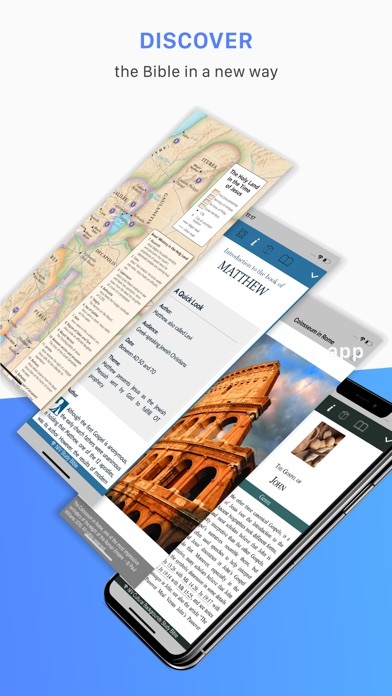 There is no doubt about it in my opinion, they are clearly working to provide the best resource for those who are looking for a bible app that you do not need a degree to understand. Yet it is packed with resources for everyone, including the serious bible student. The resources are also reasonably priced especially when things go on sale. Why do I have to retire my Celebrate Recovery Bible? I give Tecarta.com ZERO STARS, as it’s asking me to retire my Celebrate Recovery Bible. I don’t want to do that!!!!!! Please Tecarta.com respond to my entry here. What is going on? I read a plerb or article about Tecarta working with Apple to reduce the number of Applications in the App Store. Why? To me, that’s just plain old CENSORSHIP. Who are the Tecarta.com and Apple.com Corporations to think there are too many Applications on the App Store? Since when is there a limit in a free country for things like Applications? I have declared war against Tecarta for retiring the Celebrate Recovery Application from their selections. I have yet to hear back from them. iamGregoryCharles Sigvaldson. This is a wonderfully designed app! Easy to navigate. Always works perfectly both in my iPhone and iPad. I love that I can easily switch versions. Also Love all of Dr. MacArthur’s commentary. Can’t recommend highly enough!!!!! I would like to see a full screen while making notes and posting my thoughts on the many studies that I undertake while researching my fathers holy word. Very little understand this is a life or death situation. We either obey God and live or we will perish forever in the lake of fire. Thank you so very much for giving me this opportunity to express my concerns. I love all the additional features and commentaries. Very user friendly. God bless. The best Bible app I’ve used. You won’t be disappointed. Found this to be very helpful in my journey. Grateful. I am a Pastor and have found this App very useful in my Personal Studies and Sermon Preparation. It is a Must Have for Every ardent Student Of The Bible. What More, I have Records of My Notes since 2013 till date. Awesome App ! I love using this app because it's fast and not cluttered with features that don't relate to reading the Bible. The abilities to quickly flip between versions and passages and to have multiple study Bibles on hand really helps me understand what I'm reading. Can’t ever learn enough about our lord and savior! My mother and I use it as a tool for bible study and I share it with my babies. Very user friendly. Lots of translations available, most if not all of the top tier study bibles. Every easy to create and label many categories of bookmarks. 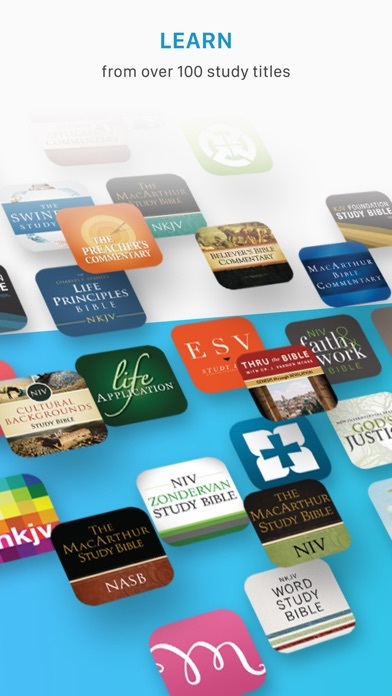 If you are an avid bible reader, this app might be the best available. If I could change one thing, it would be to add more color options on the screen. The app offers black on white, and white on black. I find red on black to be easiest on my eyes and wish it were an option. Overall, an excellent bible app. After having tried several bible apps, I finally found the best one for me and my needs. Multiple translations, highlighting, notes, study versions; this one has it all. There may be others as good, but I think none better. I am thoroughly enjoying and being enriched by the work behind Tecarta. A valued resource for anyone serious about Bible study. This app. is a God sent! I can carry all my bibles and notes everywhere I go. I Appreciate this App..I use it often..Thank you..! Great app for Bible Study! I really enjoy using this app to study the word of God using the different translations and being able to use Strongs, Thayer's and Brown-Driver-Briggs concordance to look into the Greek and Hebrew text. Very helpful Bible resource. I especially like the reading aloud option. It is very helpful in getting a lot read in a short time. It also has many other useful features such as very quick dictionary references. God's Word at my fingertips! While I love my physical Bible, l've come use this app almost exclusively. It's my go to Bible now for reading, listening, studying and so much more! It's easy to see, use and navigate! It has so many features that truly enhance my study of God's Word. I especially like that I can have several Bibles all in one place! The search and note taking features are wonderful! They thought of everything when they developed this Bible app and it only gets better and better! This is a really great app for reading and studying the Bible. With respect to the passage links, if the whole passage was shown in the pop up, I’d give it 5 stars. Do you guys listen to requests?? For a couple of years now I have been requesting a couple of things. I have spent at least $100 on this app. Please add a couple more colors to the highlighters, like purple and brown. Also, PLEASE ADD CALVIN'S commentary!!! Lastly, please add more fonts. These sound like pretty reasonable requests and I have been asking for them for years, and they never get added and I never get a response. I am a faithful user of this app and I truly study the Scriptures and could use these extra things to deepen my walk with God. Please consider these requests. Thank you. Also, I would be more than happy to pay for these extras. This is the only app that I want to use but I'm forced to switch between apps because this one doesn't offer enough of what I need. You don't need to do much to make this app perfect and worthy of 5 stars. The best Bible app keeps getting better! This Bible app has a unique way of Highlighting scripture. Using night mode I highlighted all of the New Testament in blue for easy enjoyable reading. I use the green, yellow, or underline the scripture to make it stand out from the blue. It's great! No, really. I do use this app everyday for Bible study and understanding of God's Word. It is easy to use and the versions and commentaries are a plus. My personal combination is the NASB version along with the J. Vernon McGee commentary. Both make reading through a book like Revelation easier to comprehend. Thank you for making this app available. I got this app because I was tired of YouVersion and was hoping for something more fresh that didn’t track if I got online with it daily. This sounded similar, but there’s a big catch. Nothing is free. It only comes with King James, and then everything else costs. Not sure it’s worth it. If I want a concordance or commentary I’d rather have a hard copy for the price of some of these. App was sold to another co. They promised the transition would transfer my study bible purchases. Not so. After a lot of hassle I finally gave up. We are a thoroughly blessed and spoiled generation. We have the inspired, God breathed, Word on our phones in every translation or interpretation, you can think of and it is right there in your pocket. I highly recommend the app. The versions are inexpensive, the notes you make sync to all your devices, and as someone with a Masters from one of the best linguistic schools in the world, Dallas Theological Seminary, it is so insightful to be able to look at the different translations and interpretations for inspiration. If you have never read the entire Bible, get one of the daily devotionals and set the reminder for the first part of your day. Walk through God’s word and design for your life. Be blessed! Jesus died in your place, rose from the grave, and sits at the right hand of the Father, interceding on your behalf! Praise God! This app is very easy to use and has many great offers for deeper bible study. I really enjoy all the Bibles and Commentaries that I purchased with this app, and I learn a lot about Jesus Christ, my Lord and Savior from it. Great job for inventing this app. Great app to help in studies !!! I like the flexibility in reading different translations of the Bible and book marking, highlighting, making notes, and comments on some of the scripture verses. I was able to get one of my favorite study bibles on my iPad. It is very easy to find scripture verses using search (very flexible concordance). Bought the Quest Bible a year ago and you guys retired the app. Shouldn’t I be given a new study bible free of charge to replace it. I have many hard copy bibles but I wanted one I could take anywhere, especially if I forgot to bring it to bible study. The scripture search is quick and easy. I have notes, bookmarked scripture and highlighted passages. I use the NIV regularly but also have KJV and amplified. I tell all my friends about the ease of use. NLrV. New International readers Version. Support team responded within 24 hours to address my issue, but it was my error in restoring my past purchases wrong. Issue resolved and top notch product! The Tecarta Bible is so easy to use. It offers a place to take notes, to underline and written margin notes just like a real Bible. I really appreciate the charts, maps and timelines that help me understand what I am reading, as well as the quick cross-referencing. I have been using it for several years now. I was able to transfer all my notes, highlights and the McArthur study Bible purchase quickly and easily. I noticed when I looked at my highlights the words were legible, scriptures were in order by color and it was easy to switch between the colors. I was very glad the old app was retired! Very happy for the improvements! It’s so easy to look up scripture, a specific book, chapter or single words. You can set it to auto scroll while reading, and you can adjust the scroll speed. Night reading is cool too, it doesn’t give off as much light. There are so many settings you can choose; daily reminders, verse of the day, font, font size (my fav), backup content. The list goes on!! You WILL NOT be disappointed! This app is very nice . I love the way the page turn like reading a real book. Thank a lot ,and it is easy to navigate also. I love the up grade. The audio bible is excellent . I soooo love the Bible app on my phone because of the convenience and especially when I encounter a “bad moment” in a day. My spirits are lifted for having God’s word at my disposal. If I am waiting some place there is nothing more uplifting than the word. The most intuitive, user friendly Bible App that has ever been assembled. Love this App. Much Luv to the creators of this amazing App. I logged in with my account and bought the macarthurs nov study bible when I was android user. I am unable to restore it now as an apple user. I had 2 accounts. Can you give me a support email to contact you to maybe get my study bible back since I bought it once? This is the best Bible app for everything you might ever want to do with this. The footnotes and cross references are amazing. Easily study related passages. Take notes, highlight, bookmark, share. Copy and paste to notebooks. Whether daily reading or in-depth study its the best out there. I am hoping they add a CJB translation. I keep one other app around for that one. But I’m not going to deduct a star for that. I’ve used this app for years and it really is the Best Bible app available. I love it! It’s the powerful thing ever in my personal Bible Study life. Thanks for creating it! This is the best and most solid, feature-rich Bible app out there today! I love this Bible app, my favorite. My only complaint is the audio, I love to listen to the Bible at times. I am not crazy about the dramatic reading, and then the computer reader is really bad. Fast search, overall responsive app. Great study tools. A very good app! Easy to use. Very rarely any problems. Would recommend it to anyone! Excellent tool for my bible study and preaching. I really enjoy having this app at my fingertips with multiple options for reading and studying. I love the interface and navigation menu options in this application. The simplicity of the app is what made it my go-to Bible app. I do not care for the home screen feature that has been added. It seems completely useless. I also wish the developers would do a better job of adding more foreign language translations. Chinese and Spanish are all that is available. Where is French? There are many other languages which people could use in this app. Adding many of them doesn’t require gaining permission from a publisher. I love especially the ability to highlight any verse. Wonderful! It’s the only mobile bible I use. HB214 - Love It, Love It, Love It!!! Still my favorite and most useful app! Its the least expensive when compared to others that sell each of the different bible translations available at $10 each too. Thank you for this and please keep it updated! 1/6/2019 I don’t want this 7.25.1 update I’ve purchased hundreds of dollars worth of add-ons and although it sounds like a great ideal there not nearly enough unlocked content to justify subscribing. I hate to see that the software developer has jumped on the subscription band wagon which is the latest App Store/ google play store hustle. I feel like you guys are selling out. Take what’s pure and introducing poising. I sure hope the subscription app is completely separate from my paid app pro app. I don’t want to see pop up. Subscription nags. I don’t want issues where I have to prove I’m grand fathered in because your data base can’t tell olde users from new subscription based users as people try and click over to the subscription service. That’s not fair. Don’t take my perfectly good app which is sacred to me and add this crap madness in. I don’t want to ever see home view. Of course I have it turnt off. It’s been off and I hadn’t seen it unless I choose to. There was an update and now I’m being spammed with the home view. I hate the home view. I never want to see the home view. You set the algorithm to intentionally spam user with the home view. Do right and fix that. I love spent hundreds of dollars on books. I don’t ever want to see the home view. Excellent Bible App. User friendly, intuitive, and it is loaded with study helps. I love this version of the Bible because it’s so easy to read and understand. I’ve had this app for six months, and it was totally worth the money I spent on it. I love the ability to have a several different colors of highlights, AND the ability to arrange tiered folders In which to save bookmarks. For example, besides having a New Testament and Old Testament folder with sub folders of Bible books that I have wanted to memorize or remember, I also have a folder called events. In this way it is also become somewhat of a journal. May God bless those who put this together! This app is fantastic. Great on the go, and great for the everyday working reader. The daily scripture really helps to give a boost in the morning when you don’t have much time- and the highlight tools are great for documenting your favorite passages and parables- making them easily shareable with friends and family. I’ll often highlight a scripture, screencap- and send it to my wife in the morning. Get this app! Great App very helpful with Sunday School and understanding the word of God. Easy to use, fast, reasonable book prices. Such a well-designed app and reliable. Fast search and features are easy to use. My one wish: Sepia display background color (easier on the eyes). First of all, I thank the developer for this free app. I love it. It's a great bible study tool, because I can listen to the dramatized bible, bookmark, note, save and organize scriptures into folders. I would have rated it 5 stars, but it doesn't have a print button in the app. I hope the developer will fix this. I have learned so much from this app. It has truly being a blessing. Very easy to use! This bible helps me understand how to apply The Words of God to my life in a simple application of wisdom and knowledge. After over a year of using the Tecarta Bible app, I’m happy to report that it meets expectations. It makes reading the Bible convenient and easy, so I’ve done it practically every day since getting this app. And reading the Bible every day is guaranteed to be life-changing! The app keeps up with your notes and highlights, even across multiple updates. It’s convenient to toggle between different translations of the Bible. It’s easy to purchase uplifting daily devotionals and view them. One of my favorite features is the free Verse of the Day. Now instead of waking up to the constant negativity of the news cycle, my phone starts me off with a Bible verse in the morning. Like I said: life-changing! I enjoy the app. I can add different Bible versions for minimal cost. I can also purchase some commentaries in expensively. There are so many things to see, read, learn and share! I just started this version but am loving it!!! I recently downloaded the Spirit filled life study Bible (blue icon with white dove) and thoroughly enjoyed the format with study features that I did not have to purchase separately. I am very disappointed that I was forced to switch to this app, which I would not have voluntarily purchased. I do not spend money on in app purchases and only purchased the initial app because I would be able to have the tools of my bedside study Bible at my fingertips, in one purchase. If it’s simply a matter of changing settings, please let me know and I will gladly change my rating to 5 stars. Now my iPad is a study MONSTER! I love how this has transformed my iPad into a powerful tool for my ministry! Ill Begin by say i use this app daily, and i do love it. My one request, is that it would sync my highlights and notes with the different bible translations that i have downloaded. I love the functionality of the multiple translations and commentaries. The ability to take notes and highlight scriptures, and then view across my multiple devices (iPhone, iPad, and other devices). I enjoy the finding my chapters to read daily I looking for new ways to use it more for free. The devotional are a real blessing. The Bible verse for each day, is most days exactly what I need. Thank you. 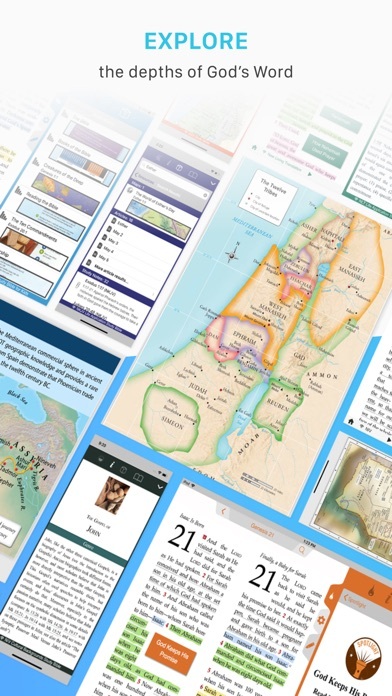 Tecarta has a good way of navigating through the Bible. Also, the study Bible seems well integrated. Good! This is my everyday routine, to get up and do my bible study and have the Bible right here at my fingertips. Love that it scrolls and can look up definitions and the touch of a fingertip. Accessing God's word on the move can be any way better. The search feature is my favorite. This has been a vast improvement for me. I love to make notes and compare God’s holy word for a better understanding of the very intent of just what his inspired words truly infer. This is a wonderful bible app. I love the ease of use, the notes ability, the search feature and the ability to synthesize passages. This is a really helpful Bible app. Absolutely outstanding customer support!!! Quick, easy to follow advice and encouragement. Would buy again! In the previous version of the app, I paid the $1.99 to remove ads. They discontinued that app & made me replace it with this. The app removal fee didn’t carry over to the new app, so in order for the new version to be ad free, I had to pay it again. (Yes, I did use my same login info). That’s annoying. I was asked to upgrade and get the new app because the old is retired. I synced first and then opened the new app. After it synced I no longer found my purchases and it seems that I need to repurchase. I don’t see a way to ask for help or troubleshoot it. I prefer this app over all other bible apps. This is my favorite Bible application. I have used it for several years. The notes allow me to capture important points from sermons and insert scriptures as quickly as they are referenced. I can prepare slideshows for our ladies’ Bible study easily between Tecarta and a presentation app. The search features are quick, thorough, and help me cross reference on topics and locate passages. My husband and I enjoy the adjustable font size. I would like to see future features to allow copying verses from the search drop down menu and it would be nice to be able to highlight, underline, or bold in the notes. Works really well and has a lot of great features! Able to take notes, cross-reference, use dictionary for further understanding of scriptural context. Allows to make a quick note bookmark it so you can come back to continue reading and studying. Thank you. TECARTA makes reading and studying the Bible such a rewarding experience. There is hardly anything I wanted that was not at my thumbs tip. It’s a mini Bible college library and resource centre. I don’t how we ever survived before it. Thank you and prayers for even greater heights ahead. I love this app and have had one like it for many years but they were going to delete it so I got this one. Both apps appear to be the same and really good but I have noticed that this one when listening to bible it will only do a few chapters And then quit. Saying downloading but it never does anything, so I have to cancel it out and then press play again to listen to a few more chapters before doing it again and again. This definitely needs to be fixed. And is the reason only 4 stars. I love and enjoy reading the Word of God. My most favorite about this app is listening to the Bible. I am able to get ready for work and the word goes right into my ears. I like the option to receive daily devotions and mark it to my favorites,highlight the verses that are important to me. The only two things that I wish would be added are unlimited highlight colors (4 just isn't adequate for deep study & cross referencing) & more translations with side by side. I can't find a literal septuigint in English. Or a Hebrew names. Or the actual Geneva in its entirety, which is a priority to me. But still the best format I've found. Great app I love it. Having everything I need with me at all times. And all the bible are great. The verse of the day has been such a blessing to me. Every day has provided me with God’s guidance and encouragement. I love the ability to look up the definition for each word and cross references. Everything you need in this app. So glad to have this option. I can look up a Greek word, I have good commentary choice, word search....love it. I use it everyday. It is easy to use. I like the upgrade as well. Best Bible App I have used. Recommend it to my friends and family. Easy to use. Easily change from one version to another. Great additional features for study and notes. Overall this is a great Bible app. I like the ability to view different translations, copy texts and customize settings. However there are two improvements needed. First, in the text navigation, you can go back to the previous text, but you can’t then return to the second text. For example, if I select John 3:16 and then go to Revelation 22:20, I can go back to John 3:16 but can’t see a way to then return to Revelation 22:20. Navigation needs back and forward buttons. It would also be nice to view a recent history of texts (maybe last 10 or customize the list size). Second, the splash screen (Home) when the app is started is not helpful. When I open the app I want to get directly into the Bible. My suggestion is to setup the app so users can decide what to see first: splash screen, Bible passage, Bible navigation, notes, etc. Great app! I love the audio. The fact that it's so is to pick up where you left off. Great work. I enjoy using this app daily. Helps me with the study of the word. It lines up with my old school study of the bible. It does not look like I am reading the newspaper as some translations seems. I love this Bible, it’s so easy to navigate. I love this Bible app! I have tried several others and this one is far superior. I love being able to take notes while studying, I like the trial options on other study Bible and devotionals and the app is easy to use and navigate! Great job! I really like the Praying through the Bible as it provides daily bread from the Old and New Testaments, a well thought out daily devotional and a great method of checking off the accomplishment of the reading for accountability. I love this app and the daily devotional, they are very uplifting. So thankful for Tecarta Bible app. I have all my translations, Strong's, and notes in one place. It's so easy to use. I Love it! Thank you! Study Bible I have been using for many years. Recommend to those who want to go deeper into Gods word. Always sync, screenshot and back up. God Bless. This is a great bible app. Especially the daily devotional and various translations. The ability to save bookmarks between devices is also a cool feature. Love the app. It helps a great deal in studying, especially when using the NASB with Strong’s. The ability to see definitions of words with a long press is great in all the translations I have used. I have not purchased anything except the NASB w/ Strong’s. I highly recommend doing so for yourself if you are seeking to deepen your study. I have tried many other Bible apps and this one is far above the rest. Been using the Tescarta for several years. Just so handy!! Can add new books very easily. Everything is really a blessing since I live in Mongolia and resources are limited. Wonderful! Customer service is super, too! Your update killed several of my Bibles! This app was awesome I used it daily. I payed for the KJV, Strongs for the KJV, NASB and the Strongs for it as well as the Life application Study bibles for both. After the update the only ones that I have are the KJV and Strongs for it. Please fix this problem! Una gran herramienta para leer la biblia on the go y en casa. Bendiciones a los hermanos que hicieron esta app posible. It looks like I lost years of notes etc. & had to buy a new version. Can someone one care enough to help with this???? Great app! Would be more useful when they allow you to develop your own sermon notes/commentary. It has been the best bible app by far. Great features. I wish there was a way to move batch notes in and out of the folder directory. I have a hard to organizing my notes. It’s kind of been these way for the past couple of years now because I have so many notes and they’re all over the place now. Please help. I really enjoy using this app and the more organized I can be the better use this app can be put to. Amazing. Great app. Use it every day. The first and best app to get all my needs met.Great selections of translations to enhance your study of Gods Word.Very easy to use notes to record services and your own input for review and study. I love the ability to put in notes and references and pull them up easily at any time. Looking up scriptures is so easy. And always having my full Bible with me is wonderful! I have always loved the feel of turning the pages of actual books. Being older now, I am loving the portability and text options of digital books. I really like this Bible because I can use it off-line. I love this, it is kept me in God’s word every day! I’ve even passed some of them on to my family and friends. Some of them have even started reading. I don’t want another day without it there’s things that it has taught me. Thank you! for having this app. It is easy to use! Love that you can highlight different colors and then it shows you all the verses highlighted in that color. I can organize my notes! Love the history feature! I installed the app because the 1952 RSV was available as a paid download. It was more of a bargain than I expected. The note taking ability is easy, as is the bookmarking. I also love the quick search tab at the top of the window, which makes it easy to find any chapter and verse. I also like that, with a free account, you can sync between different devices so that all of your notes and bookmarks are intact whether you use iOS or Android. Even if you only download it for the included KJV, it’s worth it for all of the extras.